Millie is a very sweet, gentle old soul. She is estimated to be between the age of 14-16, but could be younger. She is tiny at about 7 pounds. Millie is missing one eye from glaucoma and requires eye drops in her other eye. She has some vision and gets around the house or yard very well. Millie's potty habits are good as long as she is taken out routinely. She likes to cuddle, but asks that you go to her and pick her up. She would be held forever if you would hold her. She has one tooth in her mouth but loves food and can eat very well. She doesn't care to walk on a leash. She is old and sees no reason to take a walk. 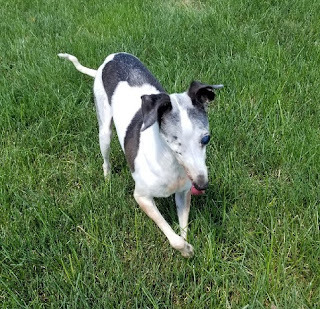 However, Millie loves to go places, meet new people and have fun experiences. She crates well at night for bed and in a car. She likes other dogs, cats and kids. She is very tiny and fragile, so young and rowdy kids would not be good. Millie loves a yard and the sun. She likes the freedom to be able to wander around and lie in the sun. 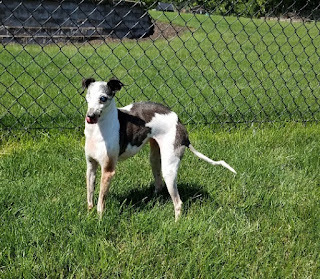 Millie came from a cruelty case. 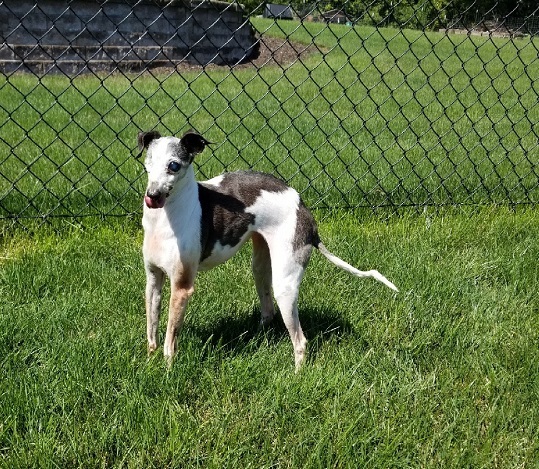 She lived in a crate too small for her for all her life, so the freedom of a fenced-in yard is a must. It makes her happy. If you are interested in this tiny girl, please contact Kim at topironhorse2000@hotmail.com. 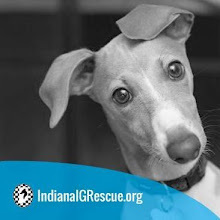 Indiana IGRescue is a nonprofit dedicated to finding homes for displaced Italian greyhounds that would otherwise be euthanized. We rescue, foster, and help IGs find forever homes. We welcome any and all questions regarding the breed and adoption process. Thanks for visiting!